Since Eastern Guruma’s establishment in 2004, Ron Villaflor has provided strong leadership to build and grow one of Australia’s most successful Aboriginal companies. Ron’s background in the public service and small business sectors have prepared him for developing and diversifying the Eastern Guruma business during his time as Chief Executive Officer, with his hard work and dedication to his team leading to the delivery of a wide range of civil and mining projects for some of our country’s largest resource clients. As Project Manager of PAI, Darren oversees daily operations of the Cleaning and Gardening teams across its Pilbara locations. Darren has many years of management experience in hospitality, safety and facility services, Camps and Accommodation in the Resources Industry. Throughout Darren’s career Darren has managed large teams and coordinated a range of activities including customer service, planning and scheduling, hiring and training staff, teaching, monitoring compliance, coordinating logistics, budgets & HSEQ. 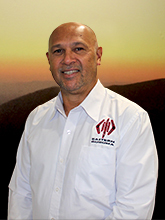 Darren’s vision for PAI is to expand the business, increase the portfolio and ensure a consistent approach to safety whilst increasing the local hire and indigenous engagement.